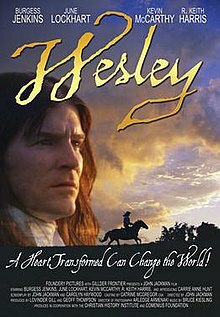 Wesley is a 2009 biopic about John Wesley and Charles Wesley, the founders of the Methodist movement. The movie is based largely on the Wesley brothers' own journals, including John's private journal which was kept in a shorthand-like code that was not translated until the 1980s by Richard Heitzenrater at Duke Divinity School. The film covers the critical period of John Wesley's life as he struggles with his own doubts and insecurities, leading up to his life-changing Aldersgate experience and the early development of the Methodist movement. Wesley was filmed in a number of authentic 18th century locations in and around Winston-Salem, North Carolina, including St. Paul's Episcopal Church. Unusual for a lower-budget independent film, it features an original orchestral score recorded by a full orchestra. The score, composed by Bruce Kiesling, uses snippets of Wesley hymns and portions composed to echo authentic 18th-century style. Kiesling, who has composed scores for a number of other films, is currently conductor of the Tulare County Orchestra in California. Funded in part by the Christian History Institute and Comenius Foundation, the movie was directed by John Jackman. Wesley currently has a 7.3 out of 10 on IMDb. Jeff Paton from The Arminian magazine called it "Impressive for a religious film;" but criticized the poor effects and overplayed ideas of "a Wesleyan Quadrilateral, which was not a large part of Wesley's emphasis or ministry". ^ Paton, Jeff (Fall 2010). "Wesley: A Heart Transformed Can Change the World" (PDF). The Arminian. Fundamental Wesleyan Society. 28 (2): 16. Retrieved 2018-08-23.